What are natural sources of creatine? How does creatine get into muscle? Do all muscles respond to creatine? In one form or another, creatine is obtained from the foods we eat. DIETARY CREATINE: Creatine is directly obtained from sources of skeletal muscle, ie meat and fish. During the digestive process the creatine contained within these foods is directly released into the blood stream where it is transported to skeletal muscle for absorption. For example, 2-3 pounds of raw meat or fish contain the equivalent of 5 grams of pure creatine monohydrate powder (see Question #7). Since heat degrades creatine, however, cooking will reduce the creatine content of these foods and increases the amount you’ll need to eat to obtain a given amount of creatine. CREATINE SYNTHESIS: When dietary creatine intake doesn’t meet the body’s needs, new creatine can also be synthesized from the three amino acids; arginine, glycine and methionine, made available during the digestion of foods. Importantly, methionine availability sets an upper limit on creatine synthesis, since the body can not produce it on its own. Methionine is thus classified as an essential amino acid and, in this capacity, provides us with our principal source of exogenous methyl groups to support growth and development. In essence, methylation maintains life! It is thus imperative that methionine be present in our diets to assure that these indispensable cellular processes continue unabated. Interestingly, methionine is also one of the amino acids used in the synthesis of creatine. Therefore, creatine supplementation, by alleviating the need to synthesize creatine from methionine, spars the body’s methyl reserves. These available methyl groups can then be used to activate key anabolic pathways. Previously, it was largely unexplained why creatine supplementation under certain circumstances stimulates anabolic hormone release, reduced blood cholesterol levels, reduced protein degradation following intense exercise (an anti-catabolic effect) and so on. In all likelihood, these “unexplained attributes“ of creatine supplementation are surely a consequence of its beneficial effect over cellular methylation status. To paraphrase, creatine promotes muscle anabolism via two principal pathways: (1) creatine supplementation increases muscle’s immediate energy reserves (ATP and PCr), thereby increasing exercise output; (2) creatine supplementation augments cellular methylation capacity, thereby creating a more favorable metabolic environment to support muscle anabolism. It is my opinion that taking full advantage of creatine’s ability to enhance cellular methylation will be the next big wave in creatine optimization. Interestingly, the ability to synthesize creatine appears to have evolved later on in the animal kingdom. Primitive organisms, such as invertebrates, do not possess the enzymes needed to synthesize creatine from amino acids, despite containing creatine in their tissues. These organisms must therefore take up creatine from their surroundings. In other words, creatine supplementation was the original strategy of life on this earth. Natural Creatine Champion: Since fish is one of the richest natural sources of methionine, eating fish provides both a direct source of creatine as well as an adequate supply of dietary methionine for new creatine synthesis. 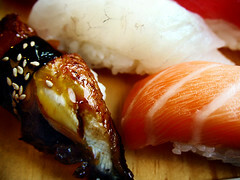 In particular, sushi and sashimi are excellent natural sources of creatine. Since these skeletal muscle sources are eaten raw they retain much more of their original creatine content; remember, high temperatures (as in cooking) degrade creatine. I personally recommend maguro (tuna), sake (salmon) and saba (mackerel), since they are also exceptional sources of omega 3 fatty acids. Omega 3 fatty acids are essential fats that are invaluable for overall good health. The omega 3 fatty acids have also been shown to reduce bad cholesterol (low density lipoproteins) and thus exert a protective influence over the development of coronary heart disease. Fish is also lower in saturated fats than either beef or pork. The incidence of coronary heart disease is well correlated with the presence of saturated fats in the diet. In light of this threat most doctors are now advising that we watch our dietary intake of saturated fats. The abundance of methionine and creatine in fish will also improve your methylation status, which is important for overall health and longevity (see above). Dietary creatine intake also reduces the levels of homocysteine in the blood stream. Homocysteine is produced from imbalances in cellular methylation capacity and has very dangerous repercussions for mental and physical health. Homocysteine is a major culprit responsible for several neurodegenerative disorders, including Down’s syndrome, Parkinson’s disease, Alzheimer’s disease, stroke and dementia. Elevated serum homocysteine has also been shown to increase the risk of cardiovascular disease (see next), renal disease, hepatic disease, and anemias.Without a doubt, blood homocysteine levels need to be kept in check and increasing creatine intake (supplementation) appears to be a good place to start. Finally, creatine has been shown to lower total plasma cholesterol as well as reduce low density lipoproteins (LDLs) levels in the blood stream and, given that fish is one of the best sources of creatine… Well, you get the picture. It thus appears that for a variety of reasons that tuna and salmon are heart smart. Vegetarians: Anyone with sub-average intake of meat and fish will express lower than “normal” creatine levels. The same is true for lacto-vegetarians, which limit their animal protein consumption to milk and eggs. Creatine might therefore be advisable for athletes who purposefully restrict their animal protein intake. Interestingly, vegetarians and vegans also typically express higher than average plasma homocysteine levels, since they must solely rely on their body’s capacity to synthesize creatine from arginine, glycine and methionine (see above CREATINE SYNTHESIS). Further accentuating the already elevated levels of homocysteine in vegetarians (and vegans) is the fact that animal proteins are the richest natural sources of the B-vitamins (folic acid, B 12 and B6) used to clear homocysteine from the blood stream and to restore the body’s methyl reserves. Creatine and vitamin B supplementation may prove particularly beneficial in these cases. The healthful ramifications of combining creatine and vitamin B supplementation are thoroughly discussed in my creatine guide.